Meditation is everywhere these days. When I started meditating and looking into meditation it wasn’t as big commercially. If you’re not currently a meditator then you need to read this. If you do meditate, then maybe you would like to share this with those that don’t. I started meditating in 2012, after hearing from countless successful people of the benefits. For me, I just got stuck in one day. No classes, no guru, no nothing. 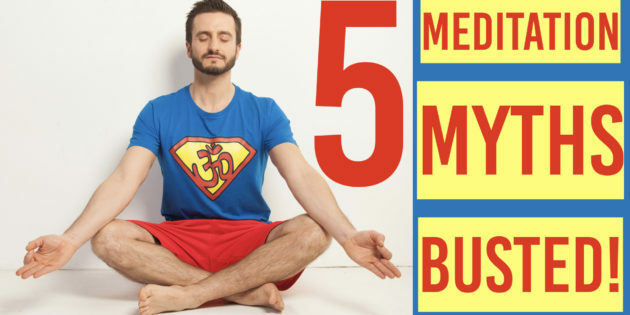 Many people aren’t like that and so I feel as though it’s my duty to bust a few myths that perpetuated in my mind about meditation prior to taking it up. Now I believe that meditation is such an important part of optimal energy that it plays a fundamental part of my Leadership B.E.A.T. Model™ for High Performers. So here are 5 reasons why it took me so long to get into it, and why you might be delaying getting started. I have to sit still in lotus for an hour and I don’t have time for it! The first myth to bust is this idea that you must sit and be all zen-like when meditating. You can in fact, do many kinds of meditation – including active meditation whereby you are mindful of the activity you are doing. In terms of the more traditional interpretation of meditation where you sit still, you really don’t need to sit that still for very long. I started by simply counting my breaths to ten. That was it. And then I increased to twenty breaths, then a minute, two minutes and so on until I reached 15 minutes. That was the most I ever did – even until I went on a Vipassana meditation, which I didn’t do until after 18 months of meditating. And then I really got a shock as on Vipassana, you are meditating for around 12 hours a day! Three of the 1 hour sessions you are not able to move a muscle – or even scratch an itch! The point is though, for you to start meditating you don’t need to do that much. Just start with a few seconds, then buildup to a few minutes. I even do what I call micro-meditation sometimes when I’m in a lift (elevator). Simply closing my eyes and focussing for a few seconds on the breath. I’m sure you can fit that in. And if you find that you’re just too busy to do 15 minutes a day….then I recommend setting aside an hour for it! My mind’s too busy to have no thoughts and reach an altered consciousness. One of the common misconceptions I had was that I can’t start meditation, because my mind’s just too busy. And that in order to meditate, I had to be able to think of nothing. The point of meditation as I see it, is not necessarily to be able to get to that. Better to acknowledge that you will have thoughts come in, but more important is not to hold on to them. Just say ‘thank you’ and allow the thoughts to leave again. One of my yoga teachers explained it nicely too, saying that the idea is not to have no thoughts, but rather to work to lengthen the gap between thoughts. Over time this can happen, but in any case, it’s not necessary. You can repeat a mantra (a word or phrase) or focus your attention on something else, like a candle. Also, something that I’ve recently got into is guided meditations and meditation soundtracks. These can help calm a busy mind really well. In terms of altered conscious, I think that expectations of this will undoubtably lead to disappointment. Sometimes you may get something and sometimes you may not. You may never get that state that you crave. The important thing for me is not to get there, or even strive to get there. If it happens then so be it (it hasn’t really so far! ), but more important for me in meditation is all the other benefits it brings. For example, decreased levels of stress levels, better sleep, more focus and slowing the signs of ageing (see Nobel Prize winner Elisabeth Blackburn’s research for more on that). I need to be trained, or go on a course to learn to meditate. I used to think this. Saying I would start when I found a good course to go on. But my question to you is this – “Can you breath?” Well, that’s all you need to know in order to get going. Just find a quiet spot, close your eyes and focus on the breath coming in….and out. Just do that. Count up to 10. It might help to visualise the breath with a certain colour or focus on the cool breath in and warm breath out. That’s really all you need to get started. Then build up to a minute, two minutes and so on. Isn’t meditation about just escaping from your problems and the reality ‘out there’? I once thought this and have heard it from others when I mention meditation as a way to relieve stress in one’s life. Sometimes people have that misconception that it’s just a way to escape, but the fact is, that unless you can manage your emotions, and in particular your stress levels, then you are unlikely to be able to make good judgement calls on whatever is bothering you. By taking time to meditate, it will help quiet the mind and allow other ideas to germinate. You may find that after meditating and then allowing the unconscious part of your mind to handle the issue that you then become consciously aware of a suitable solution or next step. That’s in addition to the physiological changes that will occur and which will help to bring down your stress levels, and enable you to better respond to the problems ‘out there’. Let me let you in to a little secret. Meditation has been accepted by many of the worlds most prolific corporate executives, athletes and achievers. I’d hardly call them ‘New Age’ – whatever that even really means, anyway! I guess the ‘New Age’ movement of the 1960’s brought meditation to the national consciousness in the West, but to think that you must be like that, or even spiritual to meditate is a misnomer. Meditation, as we covered, can be as simple as counting your breaths, focussing on an object or phrase. There’s nothing ‘New Age’ or spiritual in that. Of course, as you begin to meditate more often and deeply, you may appreciate the world you live in through a different filter. But to think meditation is just for those ‘New Age’ types is doing yourself a disservice because you’ll miss out on the opportunity for this wonderful technique to grace your life. I find that meditating last thing before bed is most important for me and if I can, I will also set aside some time first thing in the morning too, as it helps to start the day well. Finding the peace and tranquility that meditation can bring will help rest, recharge and repair your mind-body and energy levels. The idea of tranquility is, in fact, what the ’T’ stands for in my Leadership B.E.A.T. Model™. It’s a simple framework for understanding the Four Forces to Energetic Living. To find out what the B,E and A stand for, and to learn more about increasing your energy levels, I explain all here.